Native Instruments Maschine Studio USB MIDI Controller, White DJParts - All Variety of Parts that DJ Needs. 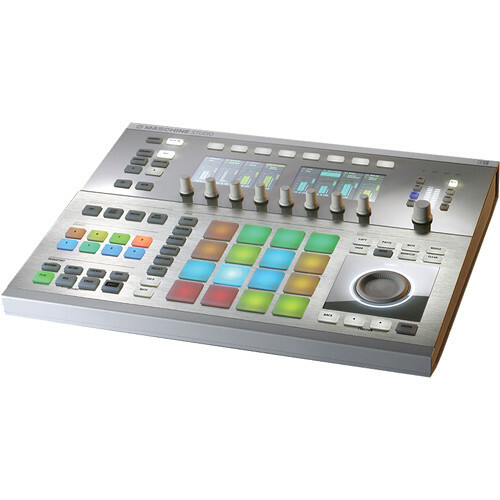 MASCHINE STUDIO is the flagship music production system for tactile, creative beatmaking with an acclaimed sound library. 1. Highly-sensitive, multi-color pads: Trigger sounds, create rhythms, change patterns and scenes featuring true-white LEDs, velocity, and aftertouch. 2. Two extra-large, high-resolution color displays: View sampler, mixer, pattern editor, arranger, channel strip, and more with 480x272resolution. 3. Edit section: Copy, paste, nudge, quantize, and adjust volume, tempo and swing with dedicated edit buttons and a jog wheel with LED ring indicator for ultra-accurate adjustments. 4. Dedicated knobs: Tweak all sampler, effect, and plug-in parameters and browse presets and instruments on eight display knobs. 5. Master Section: Toggle between master, group, sound and cue meters, and choose input source. 6. Group buttons: Select groups and group banks. Create unlimited groups and get access to 64 of them directly from the hardware. 7. Dedicated control buttons: Switch between sampler, arranger, mixer, browser, plus get direct access to plug-in strip and channel settings. 8. Transport controls: Play, record, loop, and more. 9. (referring to the back panel) Ultra-sturdy, integrated, collapsible stand. 10. (referring to the back panel) MASCHINE STUDIO is powered via included power adapter. 11. (referring to the back panel) 1 in, 3 out integrated MIDI I/O plus Kensington lock socket. 12. (referring to the back panel) 2x footswitch inputs for start/stop and record functions, and playing beats and melodies hands-free.